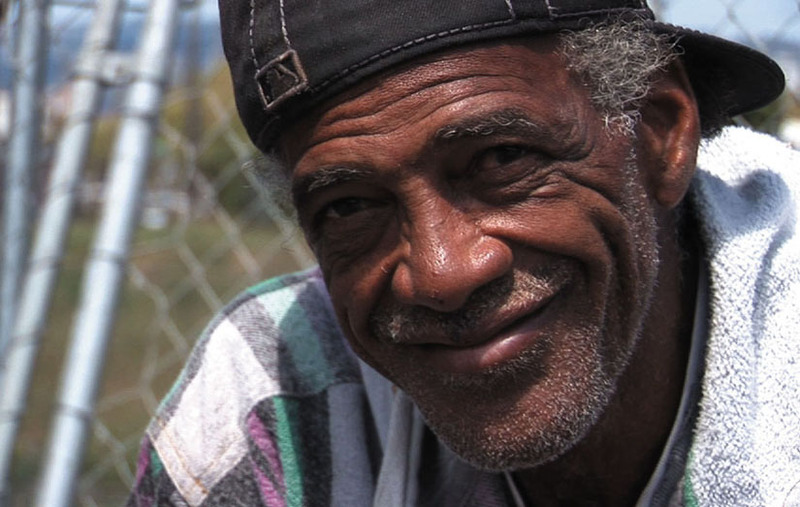 Like Ulysses, the homeless wanderers of Dogtown Redemption were exiled for years on journeys through a landscape of deprivation and despair -- an Odyssey on the streets of Oakland. Landon Goodwin, known as “the minister of the recyclers,” finds the courage and heart to rise above the cruel streets of poverty. 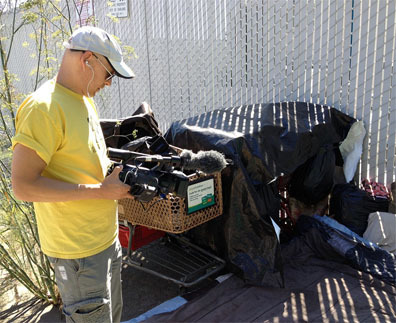 While filming the long, winding wanderings of homeless recyclers through the streets of Oakland, Amir Soltani and Chihiro Wimbush, co-directors of Dogtown Redemption, began to wonder when the redemption named in the documentary’s title would take place. The redemption at the heart of the film is not the mere act of redeeming bottles and cans at Alliance Metals in West Oakland. It is the redemption of lives and souls — the redemption of humanity crushed and battered and buried in the earth. While the film provides a fascinating exploration of the politics of gentrification and homelessness, and defends the human rights of recyclers targeted for removal by duplicitous city officials acting on behalf of an intolerant public, an issue of far deeper significance soon takes over the very heart and soul of the film — the redemptive love and friendship that rises on the midnight streets of West Oakland. Dogtown Redemption is shot through with unexpected moments of transfiguring grace, ranging from shattering breakdowns to electrifying moments of joy. It is a film that asks unanswerable questions about the very meaning of existence, and reflects on both the saving grace of love and the bitter injustice of death. That may seem like an exalted claim to make for a down-to-earth film about homeless recyclers who rummage through discarded trash. It is not. 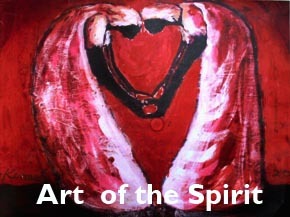 This is cinema in the shape of the human heart. At some indefinable point, right before our eyes, this film skips the rails, and a documentary about recycling transcends all the politicized issues at stake, and becomes a glimpse into the heart of the human condition. The journeys of Landon Goodwin, Jason Witt and Hayok Kay are carried out on garbage-strewn streets, yet they have the sweep of The Odyssey on the streets of Oakland. Like Ulysses, these wanderers left their homes for years on end and are exiled on endless voyages through a landscape of deprivation and despair. Their lives are alternately broken apart by despair and redeemed by love. In the seven years covered by this film, they will be maligned by an intolerant public and by unjust city officials. All three will be beaten brutally on the streets — by different assailants, yet by the same criminal indifference of society to their plight. Before the film ends, each of the three wanderers and some of their closest friends will pass through the valley of the shadow of death. Some will live to see another day. Others will never be seen again, except in memory. Moments of love and redemption take place in each one of their lives. We witness the joy felt by Jason Witt, a battle-hardened survivor of the streets who has been forged into recycled steel after a lifetime of hard blows. Yet he is greatly moved by the outpouring of love and affection from his teacher and brothers at the Contra Costa Budokan where he earned a black belt in the art of the samurai sword. In an unforgettable close-up, the face that seemed to be made of unbending iron softens and the steely eyes well up with tears of gratitude. We witness the haunting final days of Miss Hayok Kay, a kind and generous homeless woman who was dearly loved by so many friends on the street, and also loved by the film’s directors, Amir and Chihiro, who were so captivated by her spirit that they became personally involved in trying to preserve her life. Miss Kay is undone when her true love and best friend dies a homeless death, and she is then broken down piece by piece by the brutality of the streets. Yet we are privileged to witness this woman’s heart as she sings “Stand By Me” at a memorial for homeless people in Oakland. It is a song for the loves and losses in our lives. Yet, the finest image of redemption takes place in the life of Landon Goodwin, a homeless recycler Amir Soltani describes as “the minister of the recyclers.” Landon calls forth the courage and heart to uplift himself from a life of poverty and substance abuse, enters a rehabilitation program, and prays for the strength to get off the streets. At the end of the film, it’s impossible not to cheer at the sight of Landon walking down the aisle with his bride Suzette Anderson. It can’t always happen in life, but it feels so right when every once in a while, against million-to-one odds, a fairy tale jumps right out of the pages of the storybook and comes alive to enchant us. That storybook ending didn’t happen in Hollywood. These moments of miraculous hope and devastating despair all took place in Dogtown USA, an area of West Oakland supposedly named for the large numbers of stray dogs on the streets in years past. West Oakland, the place where our brothers and sisters languish in poverty, and live and die on the streets, is also the place where dreams of redeeming grace sometimes beat all the odds. In the end, those moments of love and humanity in Dogtown Redemption beat down the rotten injustices of Oakland’s municipal officials and the soaring national poverty rates, the staggering rents and the cruel slumlords and evictors. All that injustice momentarily fades away when an underdog hero emerges from the streets, puts on a wedding coat, walks into a church, and becomes a man rescued from a life of loneliness and poverty by the love he never stopped believing in. On his long day’s journey out of the streets of exile, Landon paid some very heavy dues before that moment when redemption walked down the aisle, smiling and radiant, to take the vows with him. For the co-directors of Dogtown Redemption, their understanding of Landon’s journey began on the midnight streets of West Oakland. Landon was one of the first people they interviewed, after they found him sleeping outside the Alliance Metals recycling center at midnight one fateful evening. It was so dark that, at first, Amir Soltani and Chihiro Wimbush couldn’t clearly see Landon. He was just a voice in the darkness, but they were immediately drawn in by what they heard that night. 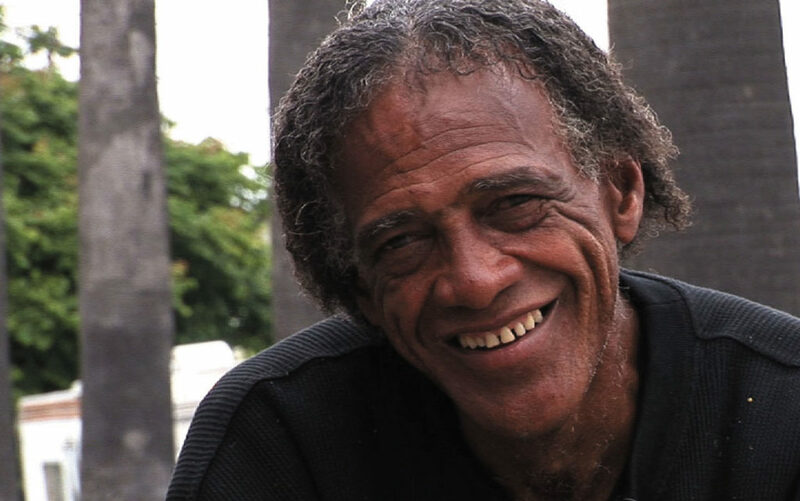 Their midnight impressions of Landon were borne out in the full light of day, when they began to see him as the pastor of the community of homeless recyclers. Co-director Chihiro Wimbush films a scene of Dogtown Redemption. Chihiro asked Landon to be the minister at his wedding to his wife Meena. The filmmaker and the recycler had become very close during several years of filming. Landon toasts his bride Suzette on his wedding day, one of the most important images of love and redemption in the film. The directors filmed Landon for several years when he was lost and lonely, desperately poor and estranged from his family — and praying fervently for a better life. 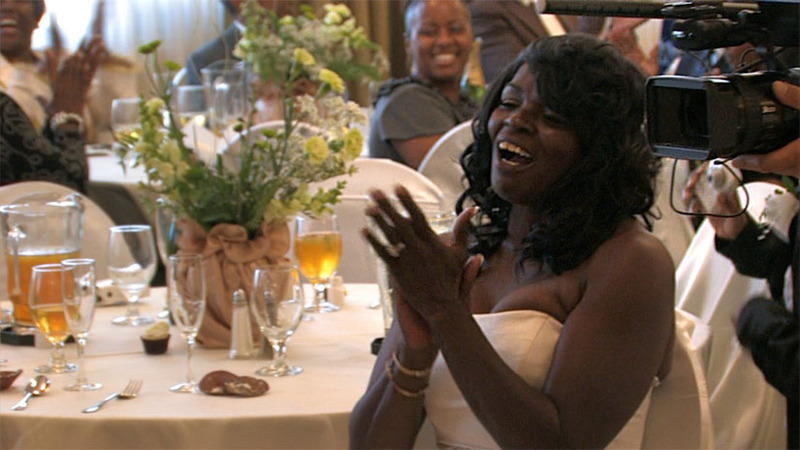 After having spent so many years filming Landon’s tough life as a homeless recycler, what did Amir and Chihiro feel on the day they filmed his wedding? On top of that, Landon was the person who presided over the marriage of co-director Chihiro Wimbush to his wife Meena four years ago. Why did Chihiro want Landon to be the minister at his wedding, I asked. When I interviewed Landon about the true meaning of the film, he didn’t say a word about recycling or the political struggles around gentrification. 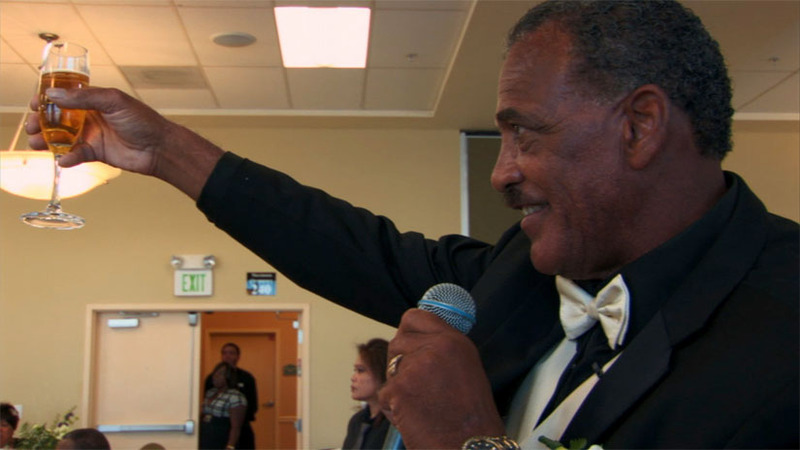 For Landon, the film was about the humanity of the people in West Oakland. I realized later that he had answered as a pastor of his homeless people. It’s a remarkable statement, and it rings very deeply true. I spent many years of my life eating, sleeping, organizing and being arrested at protests with members of the Oakland Union of the Homeless. I found far more genuine love and caring with that group of homeless friends than I have ever found anywhere else. In our interview, Landon attempted to explain why the bonds of love and friendship forged among people on the streets can grow so strong. It’s something beyond “hearts and flowers.” It’s a matter of shielding one another in the face of a hostile society. “When people have material things, they feel that they don’t need anybody or anything,” Landon said. “But when you’re poor or indigent, then you have to really depend on people. You feel basically powerless out on the street by yourself. But there’s strength in numbers, so people look out for each other. Miss Kay is not alone. Hundreds of homeless people are assaulted on the streets every year, beaten or murdered, often deliberately targeted because they are homeless and seemingly powerless. All three of the main subjects of Dogtown Redemption — Jason Witt, Hayok Kay and Landon Goodwin — have been brutally assaulted on the streets of Oakland. He himself was assaulted by four young men who beat him with a lead pipe. Demonstrating the life-and-death value of friendship for people on the street, his longtime friend Sheila Johnson came to his aid, a good Samaritan of the streets. “She carried me out,” he said. “She helped drag me out with her little bitty self.” Landon was extremely disoriented after the assault and fell down when he tried to stand up. Johnson stayed with him while someone called 911. “They ran some X-rays and they found out that I had a lacerated spleen and I had internal bleeding,” Landon said. It seems strange to say, yet the hardships and trials faced by Landon Goodwin seem to reveal the way redemption can rise from the streets. The lifeline from Sheila Johnson was the first act in this saga of redemption, and the second act began when Landon was hospitalized after the beating, and met one of his cousins occupying a nearby hospital gurney. The cousin’s brother, Rueben Baker, was the director of a program for drug and alcohol recovery in Vallejo and wanted to help Landon. This is the moment when everything began to turn around in his life. It seems symbolic that his road to healing began in a hospital after a savage assault on the streets. Reuben Baker was as good as his word, and drove into West Oakland to tell Landon he had a bed waiting for him. It is a sad and bleak moving day as Landon gathers his few meager belongings from his little camp in a vacant field. Many family members had not seen him in 15 years at that point. He is tired of sleeping on concrete and in makeshift homes in bushes. His life has changed greatly since he left that vacant lot. Interviewed last week, he is living in Vallejo and has a steady job at Traffic Management, Inc. He is happy in his marriage and he is now a pastor trying to help others come off the streets. Even if he needed to get off the streets, he greatly misses his friends, the recyclers and homeless people he knew in Oakland. The film shows Landon returning to the recycling center in Oakland and inviting his old friends back to a barbecue at his home in Vallejo on the Fourth of July. Landon said he wanted his friends to see something about home and family life that they may have forgotten. “People are not born on the streets,” he said.